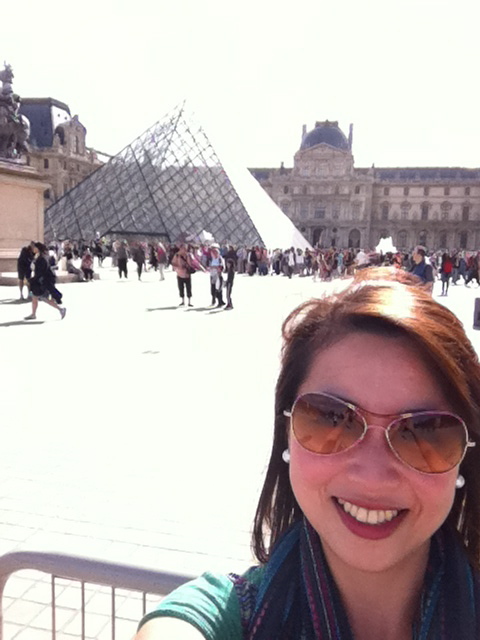 Reading Tsinoy : Lyn Ching Writes: Bonjour Paris! I love traveling. next to eating good food, that's the thing i love the most. 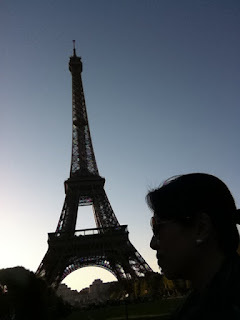 And one place i can go back to over and over again is Paris, France. 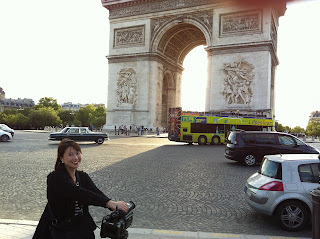 A few weeks ago, i was lucky enough to be sent to Paris. They gave me two whole days to go around and shoot what i can. and so i set about arranging the tightest shoot schedule physically possible. A few days later, armed with several different sized cameras (personal cam Sony HD and Flip Mino HD plus a professional camera), extra batteries, enough tapes for a ten day shoot, my work partner Nino and i set off for Paris via AirAsia. And after a 7 hour layover at Kuala Lumpur, Malaysia, we were finally in the City of Lights. One thing that always hits me about Paris is the history in its structures. Even amidst modern buildings and shops, there's always something old and beautiful. Of course being greeted by the magnificent ARC DU TRIOMPHE and to hear the french speak is always a big plus... ooohhhh la laaaa. 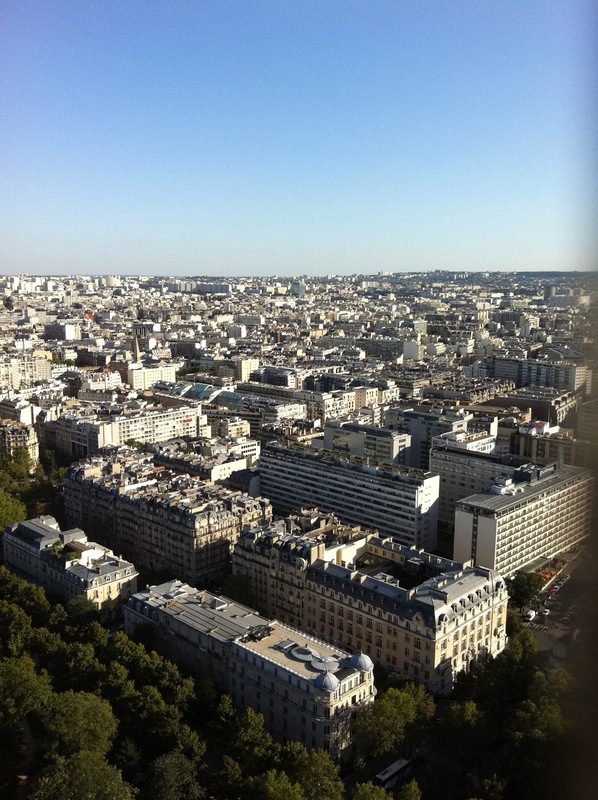 We were billeted at the very comfortable and well-priced Hotel Acacias Etoile near the arc. The room was nice and comfortable, but more importantly, they had both RER and Metro stations nearby. The Metro is the best public transportation within city. With its many stops and and easy to read maps, it's quite impossible to get lost. 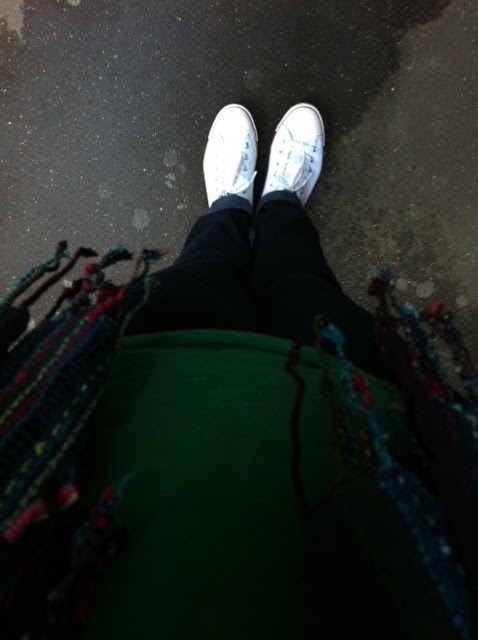 The RER on the other hand is the easiest way to get out of the city to go to Versailles and the La Vallee village outlet. Within two days in Paris, we were able to visit the Musee du Louvre, Musee d' Orsay, Saint Chapelle cathedral, Notre Dame cathedral, Eiffel tower, La Vallee Village, Arc du Triomphe plus walk along the Champs Elysee and ride the Bateaux Mouches Seine river cruise. Believe you me, by the end of the first day our feet were dead. but dragging our feet to get from point A to point B was easier knowing that we would see another beautiful part of french history. Just walking around the city itself was a pleasure. The temperature was a bit hot as it was summer when we went and tourists abound, but the idea of seeing the city with people just as excited fueled us to move faster and enjoy the surroundings ourselves. Museum visits in Paris is a must, especially both the Louvre and Orsay museums. 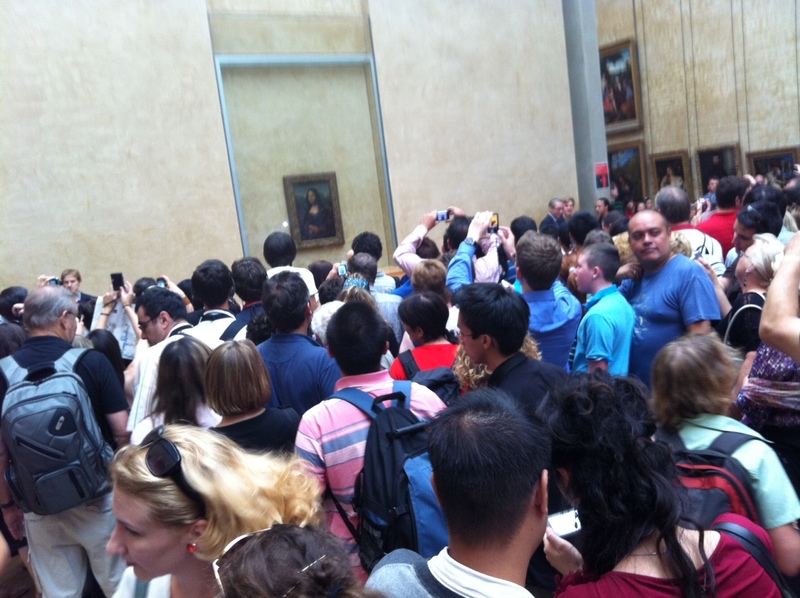 The Louvre houses 35,000 thousand artworks but it seems all tourists want to do is gawk at Leonardo Da Vinci's The Mona Lisa. I can't blame them as it is the most beautiful painting in the world albeit quite small. It was surrounded by so many people that i didn't bother going near it (i was able to do so a few years before). it was amazing though how people are so willing to squeeze themselves in tight spaces just to be able to take pictures with her. The Louvre is HUGE and it would take hours to finish looking at the most popular artworks, and to look at ALL of them would take days. If you're a 1st time visitor though, a six hour viewing time plus an hour and a half of line-up time would suffice. I have to admit the Orsay museum was a bit of a disappointment. Certainly not the artworks within the former train station, but the fact that taking pictures and videos are no longer allowed. This new rule surprised me as the last time i was there, people were free to take as many pictures as they wanted provided flashes would not go off especially on the paintings. It was a downer for fans of impressionist paintings, however it didn't stop people from lining up for hours and still visiting this beautiful museum. You can see the Eiffel tower from most parts of Paris. To say it's imposing is an understatement. 1,060 feet high, one has to look way up to SEE the top. To GO to the top though is another matter. since it was the height of summer vacation, tourists swarmed the Eiffel and lining up for tickets was hell on earth. even with my trusty umbrella, the sun was unbearable as i lined up for 3 full hours before getting our tickets to go to the first two viewing platforms. Unfortunately, buying a ticket to the the top (and 3rd platform) of the eiffel was moved to the 2nd platform. I guess it was their way of discouraging too many people from going up at the same time but It was such a letdown for someone who wanted to see the view from the top. and being bone-tired, lining up another hour for the extra ticket was no longer possible. 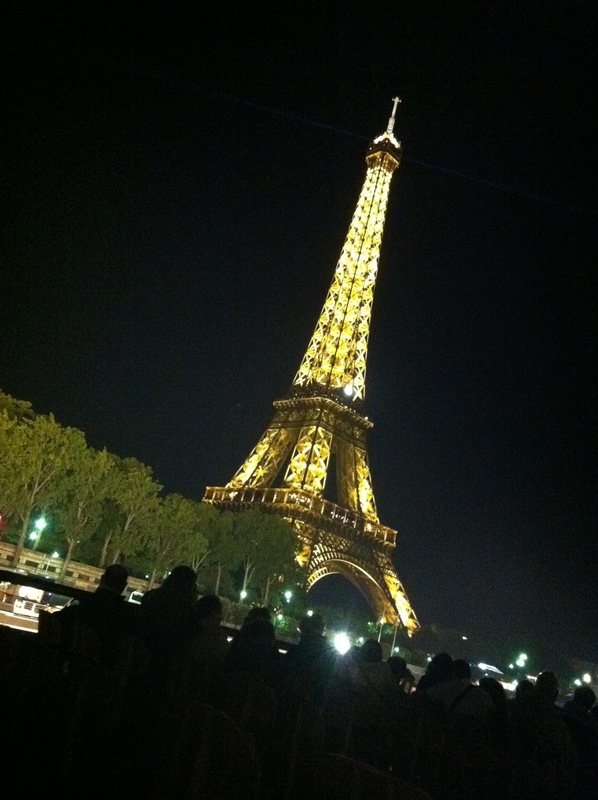 so we just moved instead to the Trocadero to see the tower at night....and My what a sight!!! The Eiffel Tower lit up by thousands of lights was great, to see the Twinkling Eiffel though was magical. it made me feel like i was in Disneyland for a second. There was even a collective ooooohhh and aaaahhhh from among the people waiting with me when the twinkling lights came on, which lasts only for 10 minutes at the start of the hour for a few hours late at night. So all those hours waiting and standing were well worth it in the end. 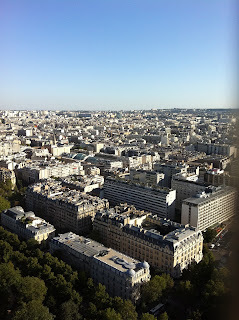 More of my Paris sojourn in Bonjour, Paris Part Deux to be posted in a couple of days. Thanks for reading and have a Great day!